Figure A. FITC conjugated mouse anti human CD3 (MCA2184A488F) and Alexa®647 conjugated Mouse IgG1 isotype control (MCA928A647). 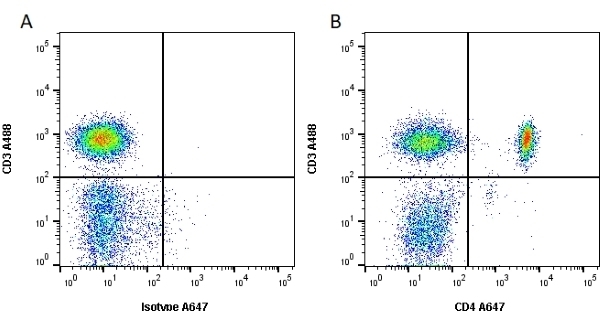 Figure B. FITC conjugated mouse anti human CD3 (MCA2184F) and Alexa®647 conjugated mouse anti human CD4 (MCA1267A647). All experiments performed on red cell lysed human peripheral blood gated on lymphocytes in the presence of Human SeroBlock (BUF070A). Figure A. FITC conjugated mouse anti human CD3 (MCA463F) and RPE conjugated Mouse IgG1 isotype control (MCA928PE). 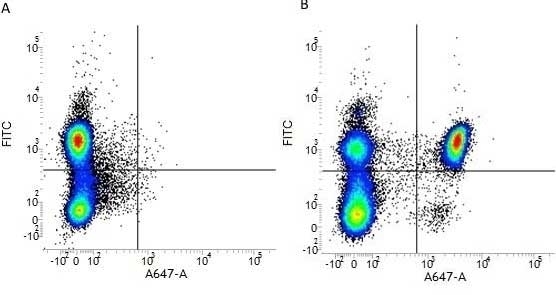 Figure B. FITC conjugated mouse anti human CD3 (MCA463F) and RPE conjugated mouse anti human CD4 (MCA1267PE). All experiments performed on red cell lysed Human peripheral blood gated on lymphocytes in the presence of Human SeroBlock (BUF070A). Figure A. RPE conjugated mouse anti human CD3 (MCA463PE) and FITC conjugated Mouse IgG1 isotype control (MCA928F). Figure B. RPE conjugated mouse anti human CD3 (MCA463PE) and FITC conjugated mouse anti human CD4 (MCA1267F). All experiments performed on red cell lysed Human peripheral blood gated on lymphocytes in the presence of Human SeroBlock (BUF070A). Figure A. Pacific Blue® conjugated mouse anti human CD19 (MCA1940PB) and Alexa488® conjugated Mouse IgG1 isotype control (MCA928PE). 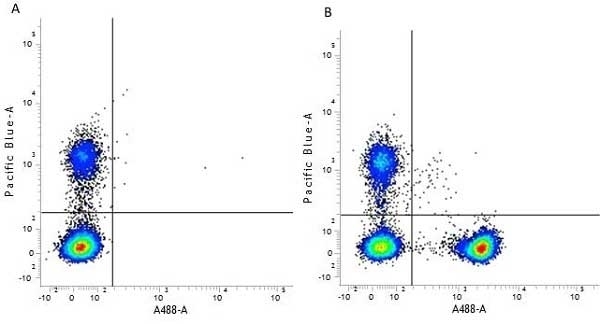 Figure B. Pacific Blue® conjugated mouse anti human CD19 (MCA1940PB) and Alexa488® conjugated mouse anti human CD4 (MCA1267A488). All experiments performed on red cell lysed Human peripheral blood gated on lymphocytes in the presence of Human SeroBlock (BUF070A). Figure A. RPE conjugated Rat anti Human CD28 (MCA709PE) and A647 conjugated Mouse IgG1 istoype control (MCA928A647). 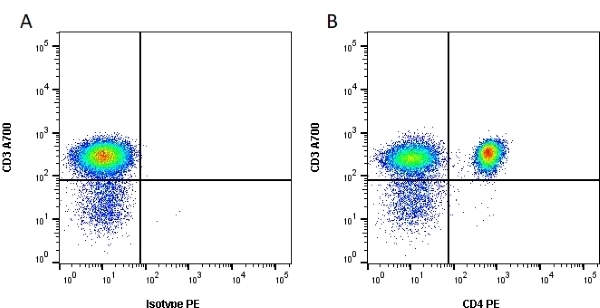 Figure B. RPE conjugated Rat anti Human CD28 (MCA709PE) and A647 conjugated Mouse anti Human CD4 (MCA1267A647). All experiments performed on human Peripheral blood lymphocytes in the presence of human SeroBlock (BUF070A). 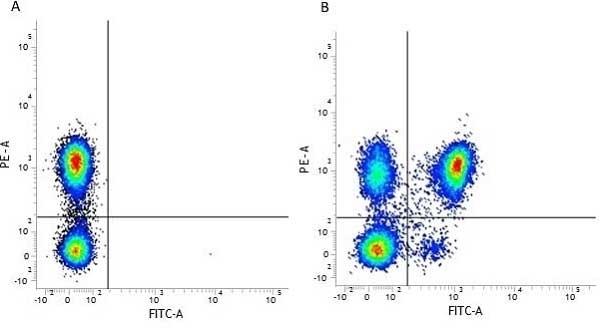 Immunoperoxidase staining of a human tonsil cryosection with Mouse anti Human CD4 antibody, clone RPA-T4 (MCA1267) followed by Histar Detection System. Low power. 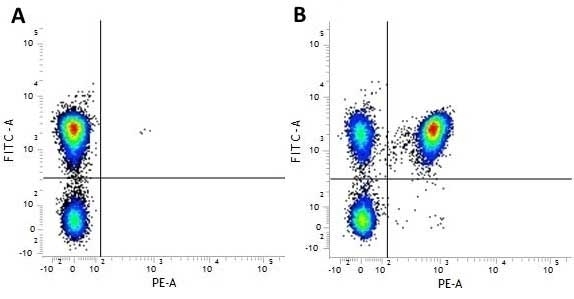 Immunoperoxidase staining of a human tonsil cryosection with Mouse anti Human CD4 antibody, clone RPA-T4 (MCA1267) followed by Histar Detection System. Medium power. Immunoperoxidase staining of a human tonsil cryosection with Mouse anti Human CD4 antibody, clone RPA-T4 (MCA1267) followed by Histar Detection System. High power. 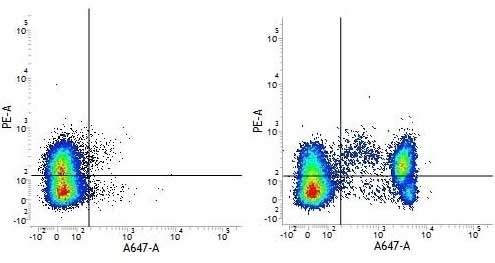 Mouse anti human CD4 antibody, clone RPA-T4 recognizes human CD4, a 55 kDa cell surface glycoprotein that is primarily expressed on a subpopulation of T lymphocytes, on peripheral blood monocytes and on tissue macrophages. Epitope mapping studies have shown that antibodies, produced by clone RPA-T4, recognize an epitope within domain 1 of the extracellular region of the CD4 molecule. Mouse anti human CD4 antibody, clone RPA-T4 has been reported to block gp120-CD4 interaction and inhibit syncytium formation, see Piatier-Tonneau et al, 1997 for details. Bio-Rad recommend the use of Mouse anti Human CD4:Low Endotoxin (MCA1267EL) for this purpose. Tandem conjugates of RPE-Alexa Fluor® 647 display fluorescence properties that are virtually identical to those of RPE-Cy5 tandem conjugates. Zarkesh-Esfahani, H. et al. (2001) High-dose leptin activates human leukocytes via receptor expression on monocytes. J Immunol. 167 (8): 4593-9. Voehringer, D. et al. (2002) Lack of proliferative capacity of human effector and memory T cells expressing killer cell lectinlike receptor G1 (KLRG1). Piatier-Tonneau, D. (1997) CD4 workshop panel report. In: Leucocyte Typing VI: White Cell Differentiation Antigens: Proceedings of the Sixth International Workshop and Conference Held in Kobe, Japan, 10-14 November 1996. Garland Pub., 1998. Pentón-Rol, G. et al. (2011) C-Phycocyanin ameliorates experimental autoimmune encephalomyelitis and induces regulatory T cells. Int Immunopharmacol. 11 (1): 29-38. Wright, G.J. et al. 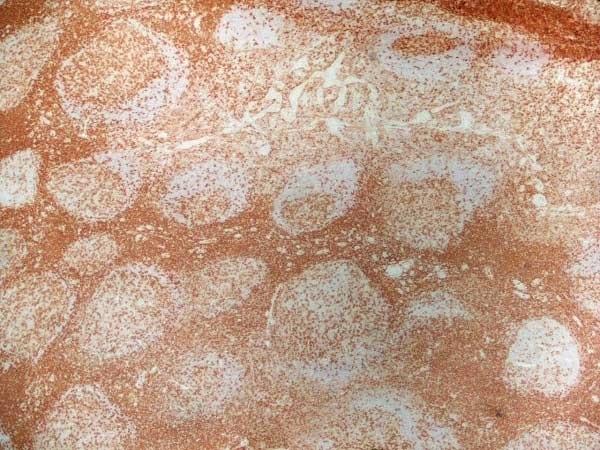 (2001) The unusual distribution of the neuronal/lymphoid cell surface CD200 (OX2) glycoprotein is conserved in humans. Bughani, U. et al. (2017) T cell activation and differentiation is modulated by a CD6 domain 1 antibody Itolizumab. PLoS One. 12 (7): e0180088.